Let me start this review by saying that you cannot really review a lock without breaking it, but also that anybody with angle grinder can break any lock in minutes: no exceptions. The focus of review is on installation and usage. 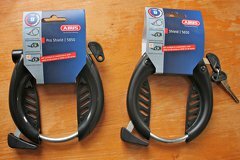 The Abus Shield 5650 and Pro Shield 5850 are both new for 2016. After both Axa Defender locks were broken in an attempted theft by a thief who apparently specializes in that lock type, which is used on many nice bicycles around here. I wanted something different, something in which a thief is less likely to specialize. This concept is called security through obscurity. By itself it offers little protection, but added obscurity may deter potential thiefs. Several online shops had the locks listed, but none of them in stock. After inquiring I was told several times they were expected to be in stock soon. Eventually Abus told me they were expected in January 2016, then May 2016, and eventually they appeared in April 2016. In the mean time I got acquainted very well with my Trelock FS 300 Trigo Folding lock. I ordered the locks, with optional plug-in chains and Abus frame mounting kit, there were no package deals, so I had to scavenge the parts together myself. 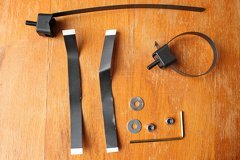 Incredibly, many stores only sell only the lock, plug-in chain or mounting kit. Both locks in their packaging. 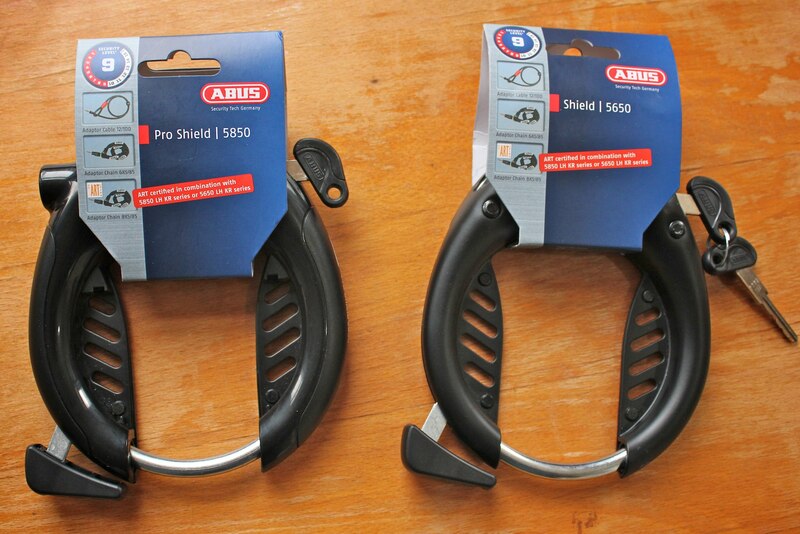 The Abus Shield 5650 and 5850 are both new, look roughly the same and have the same security rating. The description on Abus' website is almost exactly the same. The only difference is that for the 5850 it is "simple" to insert the optional plug-in chain, while for the 5650 it is merely possible. The chain hole of the 5650 is shallow without a guide around it. The chain hole of the 5850 is exactly the same on the inside, but with a plastic casing to guide the plug in. Besides that, the 5850 costs 3 euros more, and weighs 80 grams more. To find out what the difference is I ordered one of each. After careful inspection I have concluded that they are both the same inside. The 5850 has a plastic shell around it, which makes it heavier. 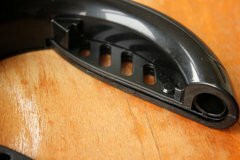 The plastic shell has a guide that makes it easier to insert the plug-in chain. The lock comes with two screws for mounting it on frames with a Pletcher plate and a pair plastic covers. Abus Shield 5650, Pro Shield 5850 and Axa Defender next to each other. The 5650 has its metal casing exposed. It is easily scratched, and probably also more susceptible to corrosion. Left in the sun the metal is likely to feel hot to the touch. It might be easier for water to get in the chain hole. It is slightly more compact, lighter and cheaper while offering the same security level. One interesting difference is that because it does not have the plastic hole guide, the plug-in chain pin does not go all the way in. The Axa RL-100 plug-in chain has a slightly shorter pin than the Abus plug-in chains. The Axa RL-100 chain fits in the 5650 but not the 5850. The casing of the 5650 is made out of metal riveted together. With the 5850 the metal is sandwiched between a plastic casing. The plastic casing of the Axa Defender is much bulkier. 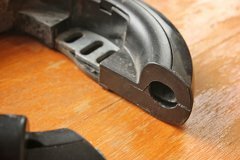 Besides these two locks there are several other variants, the NKR (non key retaining version) for each and the 5650 LH-3 which has an extra wide opening for wider tires. Ther is also the Shield 565 which looks similar. Other similar locks are the Pro Tectic 4960 and Tectic 496 which are lighter and do not have any security certification. The Tectic 496 and Shield 565 both do not have a hole for a plug-in chain, while the ones ending with a zero do. 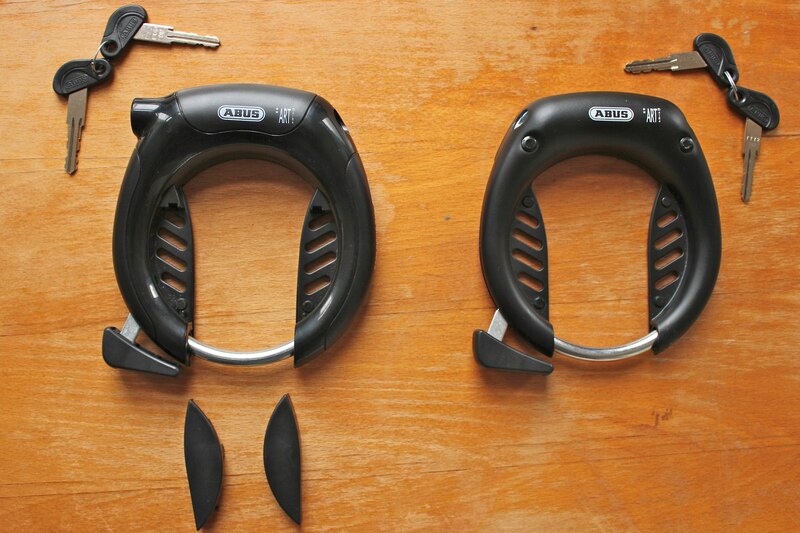 The Abus Shield locks come with two keys. The keys have the the teeth on the outside. This seems a step back from the Axa Defender, but since that lock was successfully picked, I'll give Abus the benefit of the doubt here. Another aspect of locks that I find essential is whether they offer a key service. Every lock comes with a spare key, however should you lose the key you can always order a new one using the key service. Personally I recommend ordering a new spare key as soon as you lose one, so that you always have two. 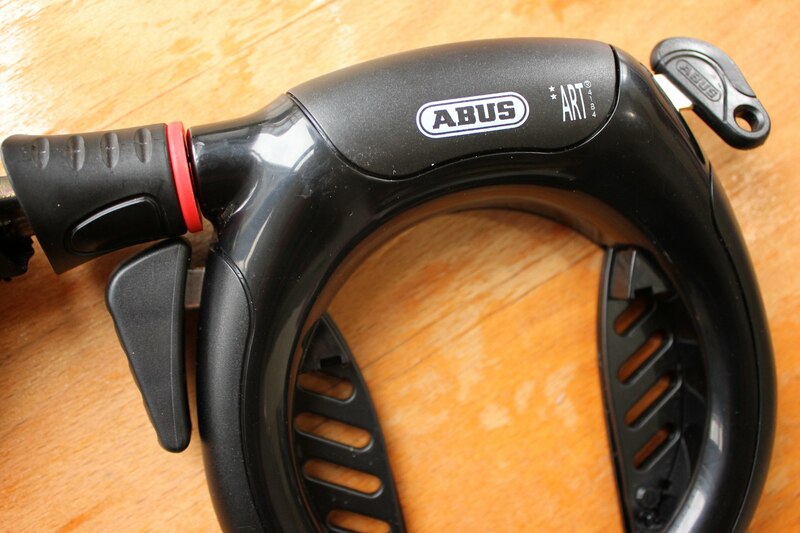 It is possible to get extra copies through a Key service that Abus provides. Installing (and removing) the Axa Defender was a finicky job due to its mounting system, even more so for the smaller 19" frame of my girlfriend's bicycle. For my own bicycle the 50 mm wide tires I had to file down the insides of the mounts. Not a fun job. 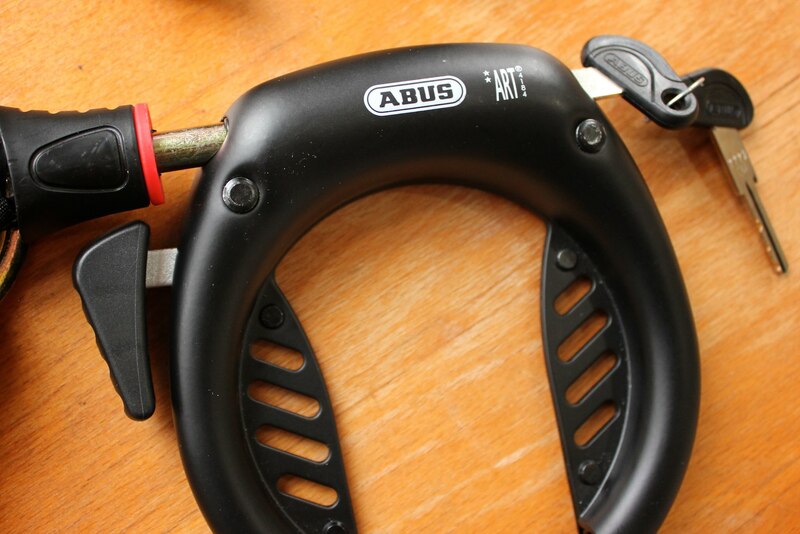 With the Abus locks, I was hoping it would be better, but did not get my hopes up. The universal (Abus calls it "uni") mounting kit costs more than 10 euros in many shops, which is pretty outrageous price when compared to the lock itself. 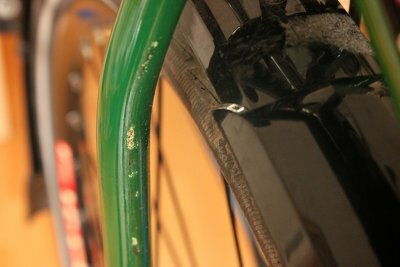 I installed the Shield 5650 on my girlfriend's 19" frame bicycle first. I was surprised at how much better the lock fit. The larger opening and reduced cylinder height allowed me to slide it right in past the mudguard, while with the Axa Defender I had to make modifications to install it so that it would barely fit, and still struggled to remove it. The mount kit came with some instructions, but they were not very helpful. It basically says install this part, then this part and then you're done, without actually instructing how to do it and what tools to use. Included in the kit is a 2.5 mm hex key, but you will also need to bring your own 8 mm ring wrench and some cutters or heavy duty scissors. 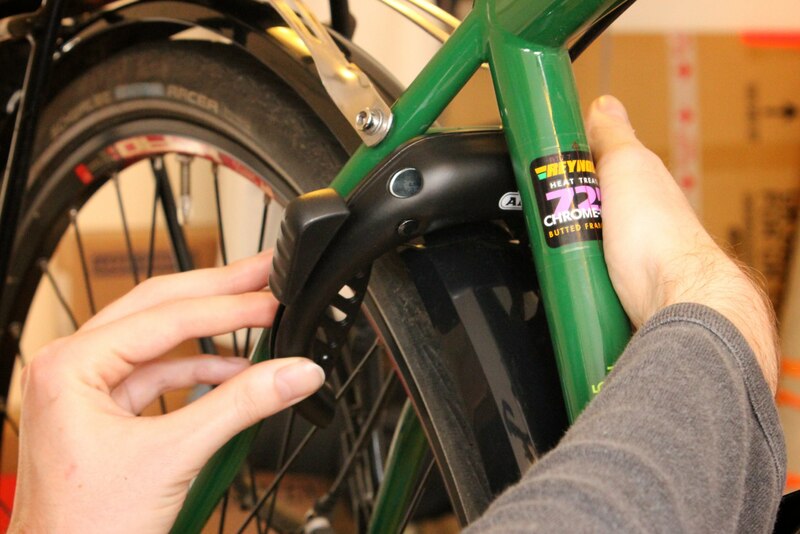 After eyeing where the lock will mount the first step is to wrap the adhesive strip around the seat stays. They will protect the frame against rubbing. 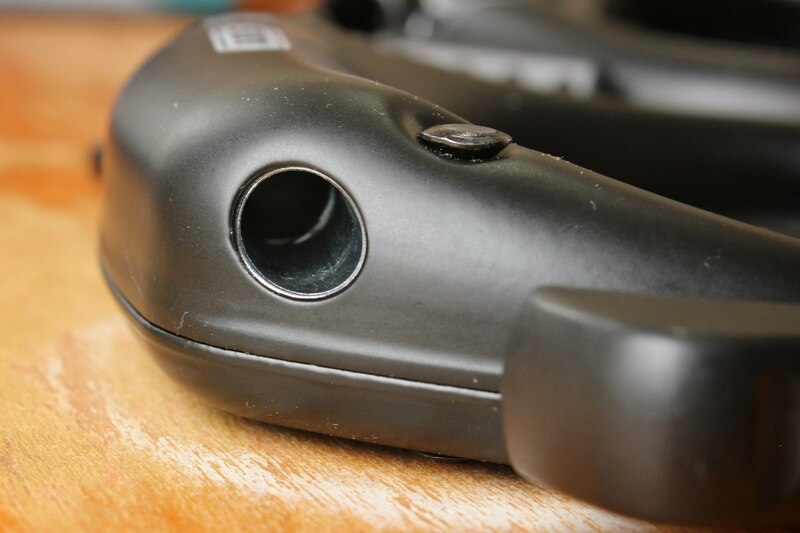 The strips are a bit flexible so you can easily correct for not putting it on perfectly straight. My first time there were no wrinkles at all. Bonus points for Abus for actually caring about protecting the frame. Flexible adhesive straps, clutching straps with screw, washers and locknuts. The M5 screw has a 2.5 mm hex socket. 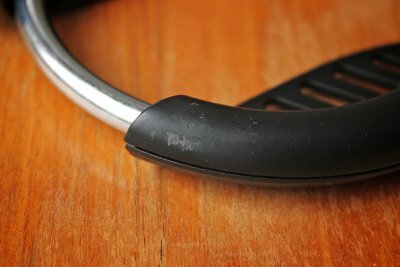 Damage left by the Axa Defender on the seat stays and mudguard from rubbing against it for two years. Adhesive strips protect the frame and the mount keeps the lock away. The next step is to put the clutching straps around the seat stays. I positioned them and put the lock on there to make sure everything as in the right place. I added the washer and nut loosely to prevent it from falling of. 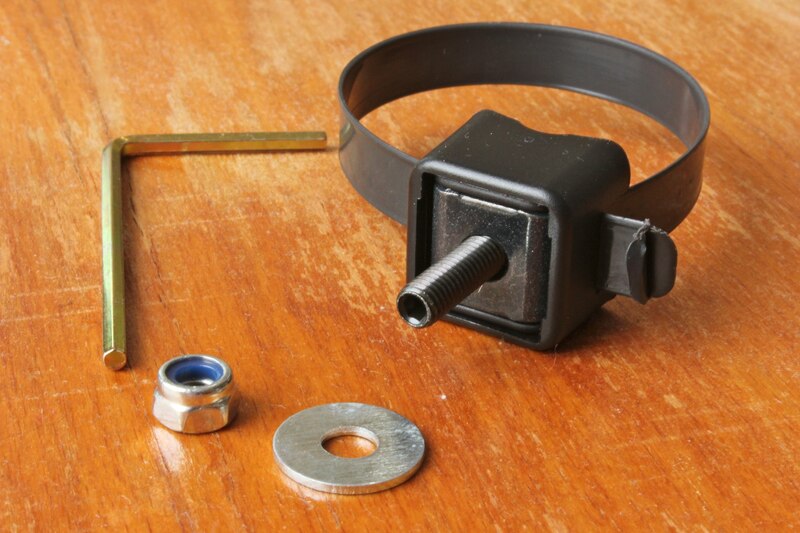 The nut is a locknut, so vibrations should not loosen the lock. Another bonus point for Abus here. After making sure everything is in the right position and the lock works you can tighten it. This is done by turning the nut with the ring wrench while holding the screw with the hex key in place. This will simultaneously tighten the straps around the seat stay. Don't turn the nut without holding the screw in place, this will strain the strap as it will try to twist. Testing out where to install lock. Tightening the nut while holding the screw in place. I did not know how tight it should be, I think I overtightened it a bit. My advice is just to try to wiggle the lock. If it does not wiggle, it's tight enough. The only thing left to do was to cut off the excess strap. Using scissors this was kind of hard. The first one came off with some effort, but the second would just be cut. Trying to get more leverage just caused the scissors to scratch the paint on the lock. Eventually I settled with cutting it further away, leaving a sharp edge, that I will have to deal with later. 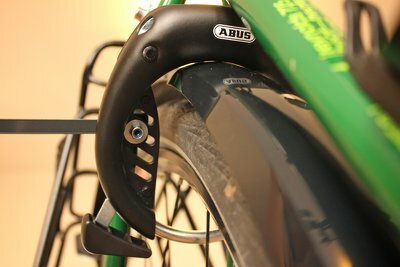 The Abus lock mounting system is superior to Axa's. 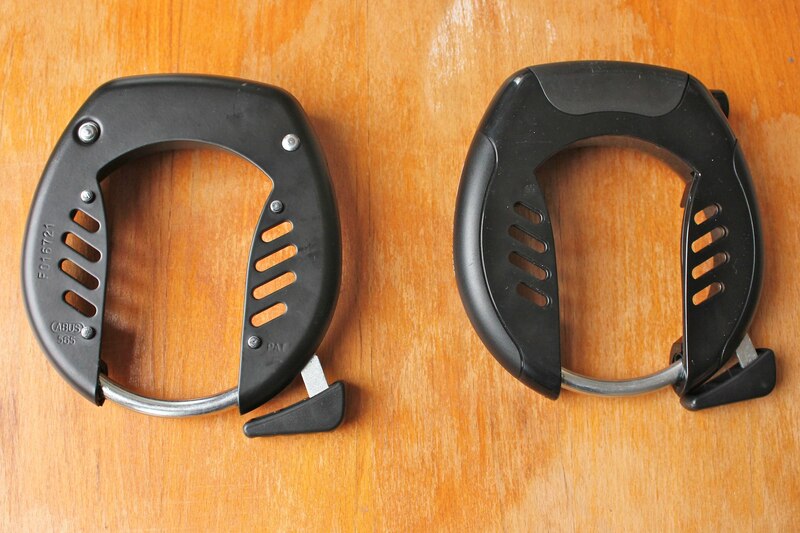 The lock is much more securely held in place and does not wiggle. The frame is protected, and the lock itself does not touch the frame or the mudguard. The major downside is the unclear instructions. Plenty of clearance around 42 mm mudguard and 40 mm tire. No more rubbing and much more clearance than the Axa Defender on a 19" compact frame. The plug-in chains can be certified as well. 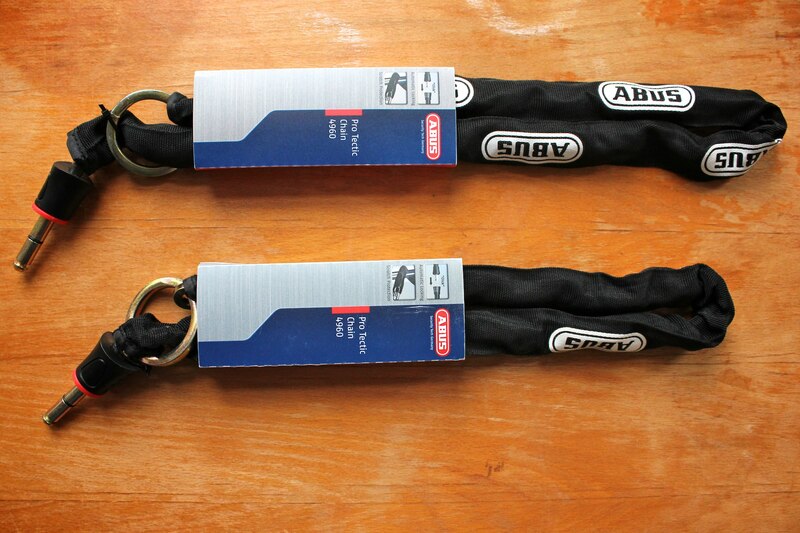 Abus sells the 6KS and 8KS versions of the chain, only the 8KS versions are ART-certified. The reason for this is probably that the chain links are slightly thicker and take a longer time to cut through. The 8KS are advertised on the package of the locks, but not on Abus' website or any shop at the moment of writing. Axa offers an international key service, where you can simply order a new key either online or by mail. For 12 euros you can buy a key service paper card at a bike shop (or online) where you write your key number and address on and then simply wait for your key to arrive in the mail. 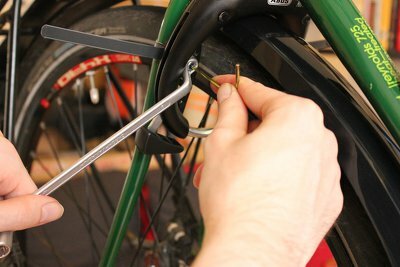 The big disadvantage of a ring lock is that your bicycle is not locked to another object, and although it cannot be ridden and can still easily be taken. This problem can easily be remedied with the optional plug-in chain. For the Axa defender I still had an RL-100 plug-in chain laying around to compare with. Abus 6KS/85 and 6KS/100 chains in their packaging. The ends with the pins show the difference in length relative to each other. The Abus Shield locks have a 10 mm hole where a chain can be inserted. Abus sells plug-in chains specifically for these new types of locks (4960, 5650 and 5850). They are often marketed as 4960 chain, because up until recently that is the only Abus lock where it fit. Abus chains for other locks will not fit. The last link is larger so that the plug can fit through there. 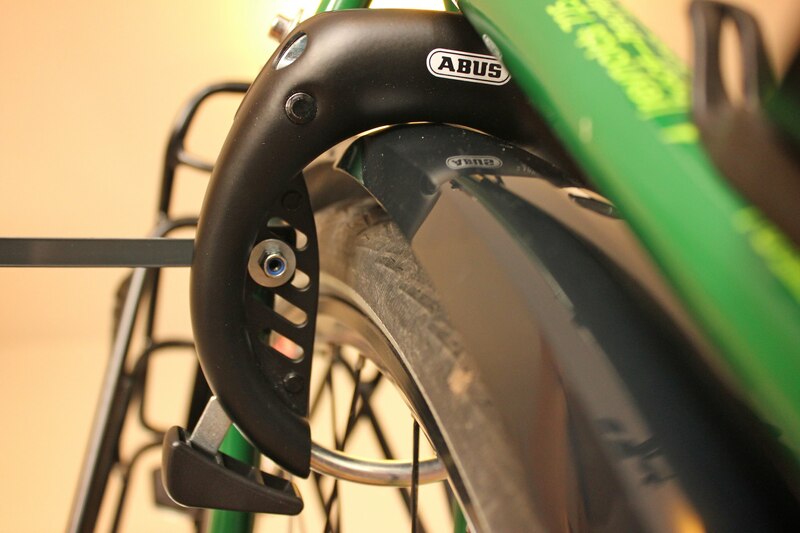 With the Abus chains link is significantly larger, making it easier to put the slightly wider plug and chain through. At the moment there are at least five different chains with different thickness, and length. I got two with 6 mm thick links and an advertised length of 85, 100 centimeters. A longer one that is and 130 centimeters long also exists. 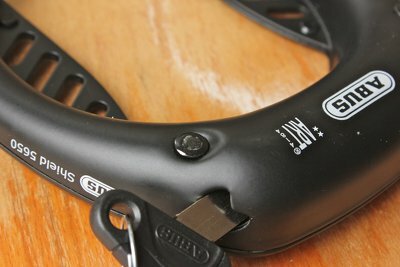 Abus plug-in chains only come in the color black. 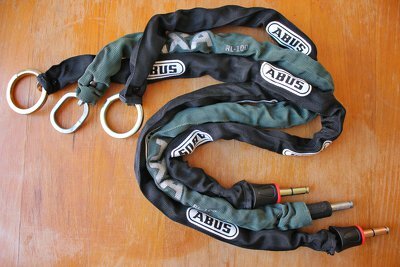 When measuring I found the Abus plug-in chains to exceed their specifications. The measured length was significantly longer, while the Axa is only one centimeter longer. The links were hard to measure since they were not perfectly square after being bent. The thicker chain links increase the weight significantly. Personally I prefer the lower weight, as I don't think the extra effort/time to cut through them matters much. Very interesting is the fact that both Axa and the new Abus chains have a pin diameter of 10 mm. After comparing their shape I found them to be very similar. I tried inserting the Axa chain in the 5850 lock, but the pin was not long enough, the plastic hole guide prevented it from going in deeper. However, the Axa chain did fit in the 5650, something that I had not expected. 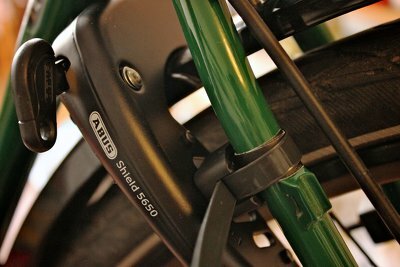 This makes the Abus Shield 5650 more versatile in accepting a wider range of plug-in cables and chains which can be lighter, longer, and/or cheaper depending on what your needs are. The shallow hole of the 5650 leaves part of the 42 mm long pin exposed. The plastic casing of the 5850 makes for a snug fit. 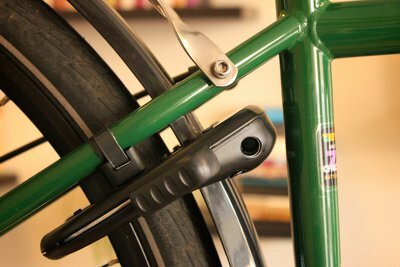 The solid mounting system, helps a lot with making the lock feel better. To close the lock you need two hands, one to turn the key and another to push down the lever until it clicks and then pull out the key. I bought the KR (key retaining) version, which is the most common one, and also required by bicycle insurance companies, who want you to have two keys to prove that you locked the bicycle. 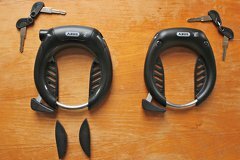 Abus also sells a NKR-version (if you can find it) which allows you to take out the key, its main use is bicycles used for carrying children on the rear where a (stupid) child could lock the bicycle while riding. Unlike with the Axa Defender the plug-in chain can be inserted after the lock is closed, which makes it a bit easier, as you don't have to worry about keeping the chain in while closing the lock (which already requires two hands). One thing that is not better than the Axa Defender is the shape and position of the lever. It is on the side for both the 5650 and 5850 as opposed to the front like the Axa Defender. It's long and pointy at the bottom, which looks weird. 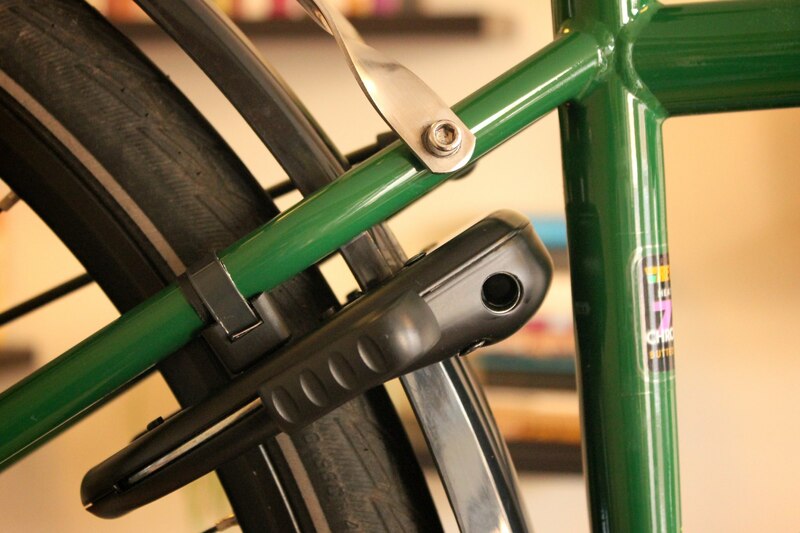 You lock the bicycle by pressing down from the top, but the top is small and rounded. Alternatively you could grip it by the sides which are smooth and narrow. 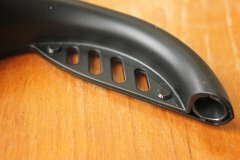 The outside has a large surface and has ridges, but I could not find any use for them. There is no way to get any leverage on this side. The lever design is completely ridiculous. 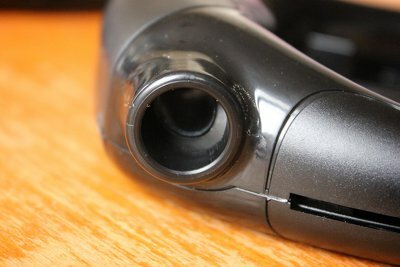 A minor annoyance is a lack of smoothness when using the lock. Turning the key takes significant effort, so does pushing down the lever, while it makes a scraping sound. Opening the lock has the same scraping sound followed by a loud "clack". A brand new top of the line lock it should be smooth, effortless and quiet to use. The metal casing of the 5650 scratches very easily. It was already scratched when it arrived. The metal rivets also do not hold their paint very well. 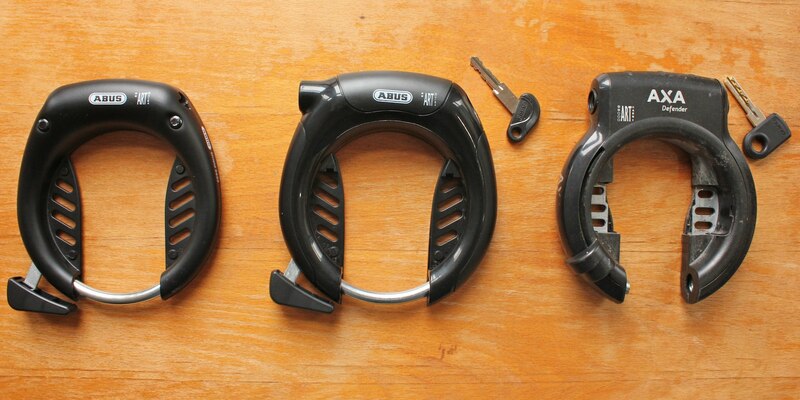 Abus has created some nice looking ring locks with a low cylinder height and wide opening and mounting system that is superior to the popular Axa Defender. The only major flaw I could find is the slippery lever. The 5650 and 5850 are the same lock inside. The 5850 has a nicer finish in my opinion, but it's more expensive and heavier. The fact that the 5650 also accepts a wider range of plug-in chains tips the scale over in favor of the 5650 as my lock of choice for now. This could still change if after long term use some of the potential flaws of having an easily metal exterior with an easily scratched paint layer will prove a problem in the real world. Update April 2017: After about a year both locks are still in operation. As far as I know nobody has tried to break them. The 5650 does not have any obvious scratching or rust. The one part that has degraded is the mounting clamps. The plastic straps have loosend a bit and the lock moves around more than I would like. The main cause seems to be when the lock is closed and the wheel turns, the spokes push against the lock which strains the straps. The problem is that there is nothing to hold the lock in place on top. I am considering adding something myself with tie wraps or something to improve the situation. Update July 2017: The strap of the 5850 has come loose. The lock is now held together with a tie wrap. On the 5650 there is a small rusty spot (1.5 mm diameter). My conclusion is that the mounting system is not very durable. I have removed it and wrapped vinyl tape around the frame and strapped the lock on it with tie wraps, two on each side around the seat stays, and two on the top around the lock cylinder and seat stay bridge. The lock is very secure, there is no wiggle room. If a tie wrap breaks I can easily replace it with another one.